Stephen's Phone Blog: Life in the old girl yet. . .
Life in the old girl yet. 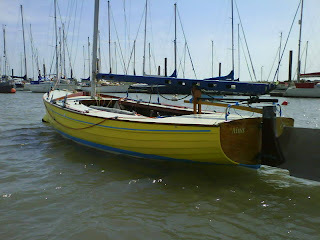 . .
Our Brightlingsea One Design "Aina" was built in 1939 and we live in what was once the home of her designer Robbie Stone who designed them in 1925. She is in pretty fab condition for her age - as you can see - and we spent the weekend getting her ready for Pyefleet Week - the annual BOD championship on England's East Coast. She is ready now, after a lot of work, but first there is the small matter of Cowes Week and Ramsgate Week in our big boat Cracker. Work friends will understand why I need to stop work for August (and a bit more); this is all hard work - and great fun of course. Meanwhile Aina looks gorgeous, and pretty frisky, for a 69 year old doesn't she?